Earnings season off to a slow start but it’s early. With just 55 S&P 500 Index companies having reported results, fourth quarter earnings growth for the index is tracking to a 14.2% year-over-year increase, below the 15.8% consensus estimate as of December 31. Most of the shortfall is attributable to financials. Overall, 76% of companies have exceeded earnings estimates, consistent with recent trends, while a somewhat disappointing 58% of companies have beaten revenue targets so far. Slowing global economic growth, U.S.-China trade tensions, and energy sector estimate cuts have contributed to the 1.5% year-to-date drop in 2019 S&P 500 earnings estimates. China data disappoints, IMF lowers global growth forecast. Gross domestic product data out of China over the weekend showed growth in the world’s second largest economy fell to 6.4% year over year in the fourth quarter, a level not seen since 1990. The International Monetary Fund (IMF) further darkened the mood when it cut its global growth forecasts for this year and next by 0.2% to 3.5% and 3.6%, respectively. Though the revisions are not significant, they mark the second downward adjustment in the last three months and additional cuts could come if U.S.-China trade tensions escalate, the U.K. leaves the European Union without a Brexit deal, and/or if China’s economy takes a turn for the worse. However, it should be noted that, while impact of a “hard Brexit” to the U.K.’s economy would likely be meaningful, the impact to the global economy would not be as the country represents just 4% of global trade. 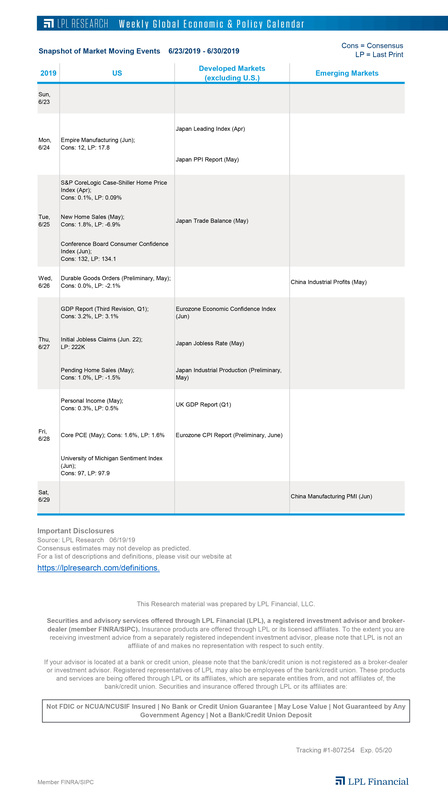 As for the other potential catalysts, our expectation remains that the U.S. and China will come to terms as both sides have a lot to lose, and China will utilize whatever means necessary to ensure GDP growth is within its 6.0-6.5% target range for 2019, so we think the concerns may be overdone. Brexit uncertainty continues to cloud Europe’s economy. On January 15 more than two-thirds of U.K. Parliament voted against British Prime Minister Theresa May’s separation deal, another bump in the road for “Brexit.” Though that outcome had been anticipated, the wide margin underscored the tough road ahead. Even though May kept her job after Wednesday’s confidence vote, the margin was narrow, adding uncertainty. As a result, even more than two years after the vote, Brexit still has the potential to weigh on consumer sentiment and business investment in the region. In this week’s Weekly Market Commentary, we discuss potential market implications of the U.K.’s ongoing effort to leave the European Union and share our latest views on European equities and, more broadly, developed international equities. Main Street’s growing uncertainty. Recent U.S. economic data have been sending a lot of conflicting signals, and Wall Street’s economic outlook is more clouded than at any point of the cycle. In this week’s Weekly Economic Commentary and on the LPL Research blog, we’re providing direction from Main Street’s view of the economy using context from the Federal Reserve’s most recent version of the Beige Book. Another big weekly gain. The S&P 500 Index added 2.87% last week, for the best week since late November. This was the fourth consecutive weekly gain and it was also the fourth straight weekly gain of at least 1.5%. In fact, the last time the S&P 500 was up 1.5% for four consecutive weeks was coming off of the March 2009 lows. You have to go back to 1996 and 1976 for the other most recent times we saw four strong weeks like this. This is a historically strong bounce, but it is worth remembering this is happening after the worst December for stocks in 87 years. New LPL Market Signals Podcast. In this week’s episode of the Market Signals Podcast, LPL Financial Chief Investment Strategist John Lynch and Senior Equity Strategist Jeff Buchbinder discuss the upcoming earnings season and why it’s expected to be good. Subscribe to the free Market Signals podcast series on iTunes, Google Play, Spotify or wherever you get your podcasts!